California has recurring droughts and the cost of watering landscapes has become a significant cost. The days when large swaths of grass were practical for large yards may be gone forever. There are a wide range of drought-tolerant or low maintenance plants available from attractive succulents to long grasses that are remarkably hardy. Believe it or not, even artificial grasses can be pleasing to the eye and suitable for playtime. GardenScapes’ mission is to create an inviting, colorful and richly textured garden that complements the architecture of your home and the surrounding environment. We are committed to do this in an cost-effective and creative way. 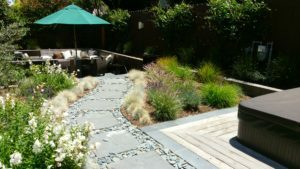 We specialize in landscape design with a focus on ‘softscape’ — trees, shrubs, perennials, and annuals. Our services include yard layout and design, project management and/or consultation, plant selection, procurement and installation. We have over ten years of local experience and extensive references. GardenScapes has three general service categories: staging a home (in particular, the yard) for sale, garden remodels for a current residence, and commercial landscape design. © 2010-2019 GardenScapes. All rights reserved.